Everyone is trying to get ahead of collaboration. Find out how your company compares and what you need to consider. 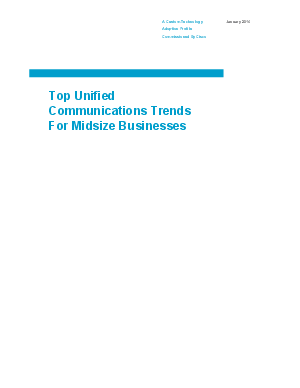 Read "Top UC Trends For Midsize Businesses", a commissioned study conducted by Forrester Consulting on behalf of Cisco to learn about the latest trends and how others are planning for the future. Download the complimentary study now to get started.